There's something amiss this morning. I can't help but feel something is wrong. There seems to be no rain falling upon the tent and even more worryingly it appears as though there's some actual sunlight visible through the tent material. I check the internet to make sure the apocalypse hasn't arrived. It hasn't, I'm still a scruffy oik and Sharon's not become a wealthy heiress. I like Sharon quite a lot, I just think I'd like her even more if she was wealthy. At least the walk into town for milk is dry. After yesterday's non-motorcycle exploration of St Davids today we ride! Sharon decides to ride pillion once again and I'm glad, sort of. I want her to ride, to gain more experience and to keep on building on the solid foundations she's already created. But, well, I can understand the appeal of sitting there and letting someone else take the strain, of being able to stare without concern of running into a ditch, to just be whisked away. Hmmmm, I wonder, perhaps I should make her ride and I'll go pillion? That's just not going to happen. With her ladyship parked behind me we set off once again. Whitesands Beach Looks lovely but they want payment to park there, it's not that lovely so we turn around. 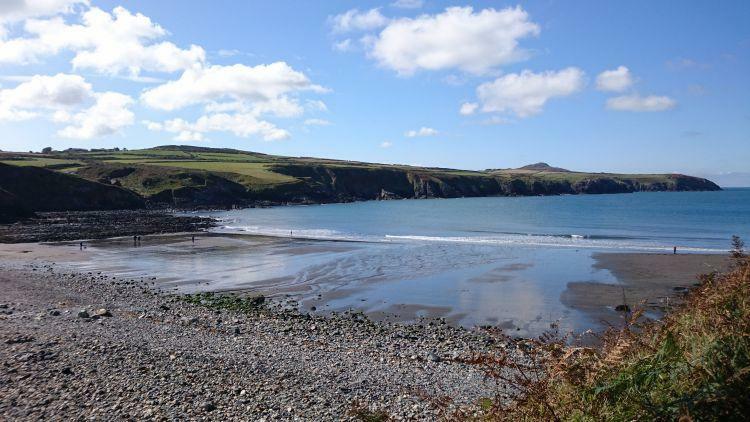 Abereiddy on the other hand is also lovely and parking on the rough deeply puddled gravel is free. Here we find "The Blue Lagoon". 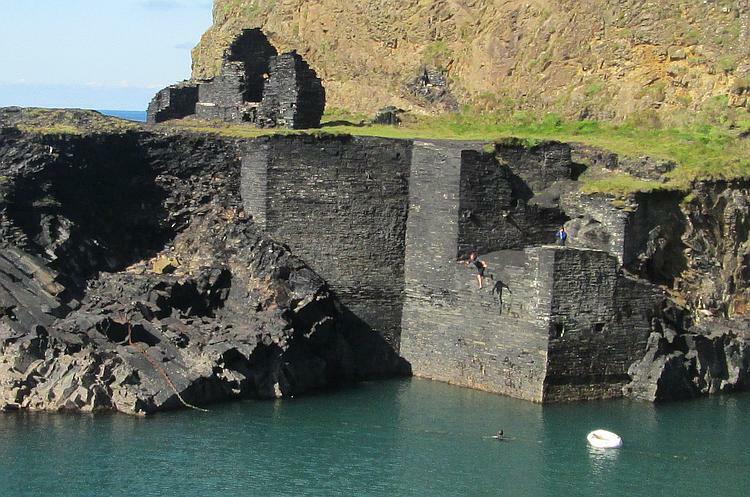 The sign tells us this old slate mine was blasted to allow the sea in creating a very deep pool. Annoyingly healthy chaps are daring each other to jump in and there's a canoe milling around too. It'd be a bit much to actually charge to park on this rough car park. "Jump damn you!" Brave lad, braver than me. Taking the A487 East and South we pass through the pretty village of Solva but they want payment for parking (again) so stuff that. The beach at Newgale is very long and sandy. 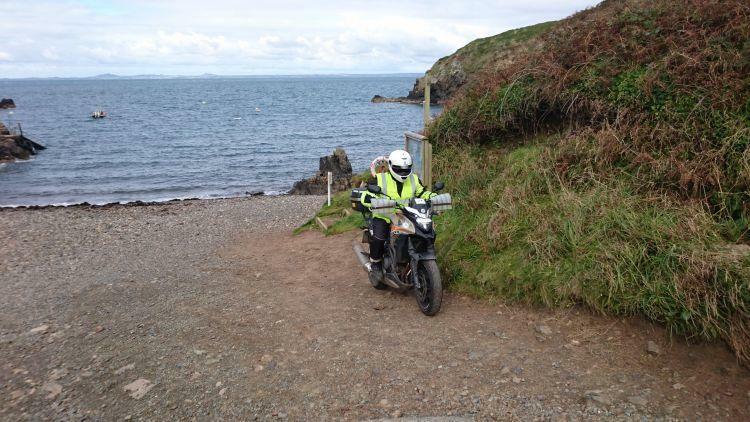 Taking the coastal route we ride narrow lanes up hills and down valleys until the road is closed after Nolton Haven. By hook and good luck I get us to Broad Haven where we purchase dinner from a Londis. Newgale Beach is huge and practically empty today. 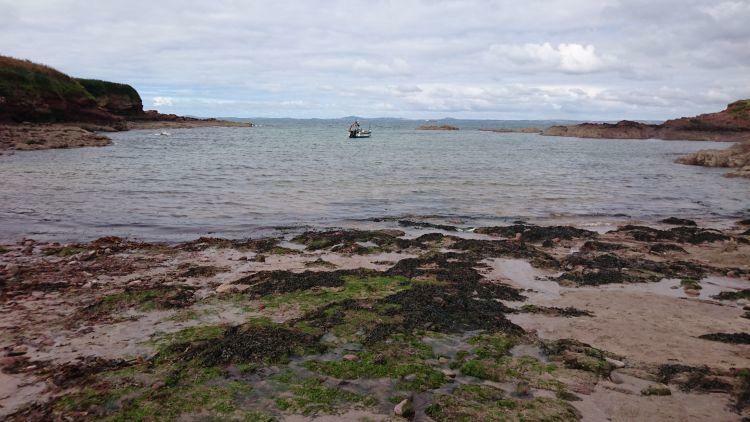 St Brides is an access point for canoeists and those with little boats wanting to get to the sea. Trying to get as far along this part of the little peninsula we arrive at the Lockley Lodge Visitor Centre. I know this road is a dead end, the maps tell me so. As we approach the sea the road is also getting very steep. "Erm, do you want to turn around now?" Suggests Sharon. Naaaah it'll be fine. "The road is getting very narrow, will you be able to turn around?" I'm a roughty toughty biker, I'm not scared. "The road is very steep and narrow, you're going to run out of road!". Stop fussing woman. "It's fine, not a problem, what you fussing about?" We run out of road. There's only a tiny shingle beach left before the sea. "Do you want me to get off?" Erm. Er. Yeah, yeah you'd best get off Sharon, I don't want to drop the bike on you. It takes all my energy, effort, skills and a large dollop of luck to navigate the 27 point turn on the shingle. I manage to remain upright but I'm huffing and puffing and blowing and sweating by the time I'm finally pointing away from the sea. Stupid boy. All along the coast we've been blessed with coves, beaches, rocky outcrops, hills, valleys, rivers, pleasant villages, narrow lanes and even a little sunshine. 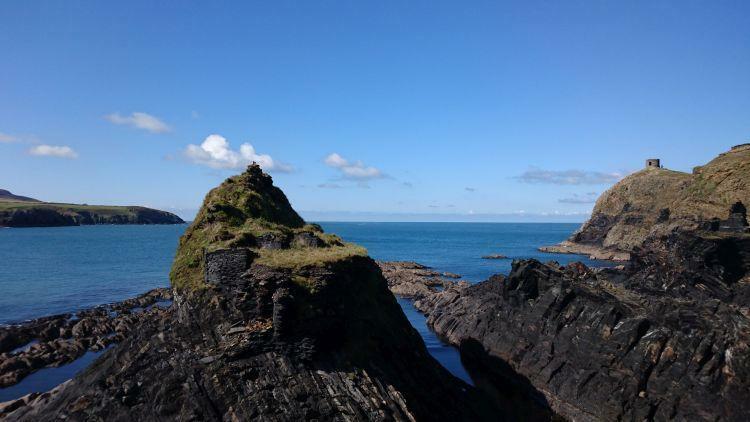 The Pembrokeshire coast is a delight and my words will never do it justice. There is an omnipresent blot on the landscape though. 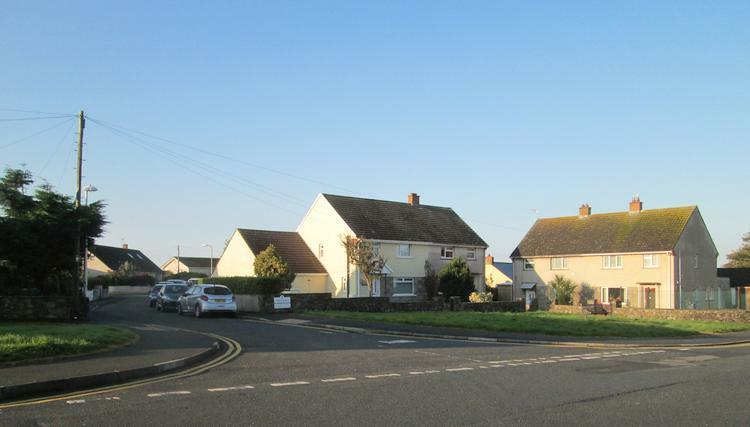 Milford Haven. At the crest of every hill as we scan the horizon there are industrial looking towers and a tangle of busy looking buildings in the distance. I know Milford Haven is a port for big ships bringing oil (I later learn it's actually gas) into the UK. While I wish to surround myself with beauty and wonder I think it's important to also see the other side of an area. We ride for Milford Haven. I'm expecting a dirty run down industrial wasteland. Instead I find a perfectly ordinary and in places quite cordial town. The harbour has smart apartments and the centre could be any other town. There's nothing unusual here and I mean that in a positive way. It's fine, I feel comfortable here. 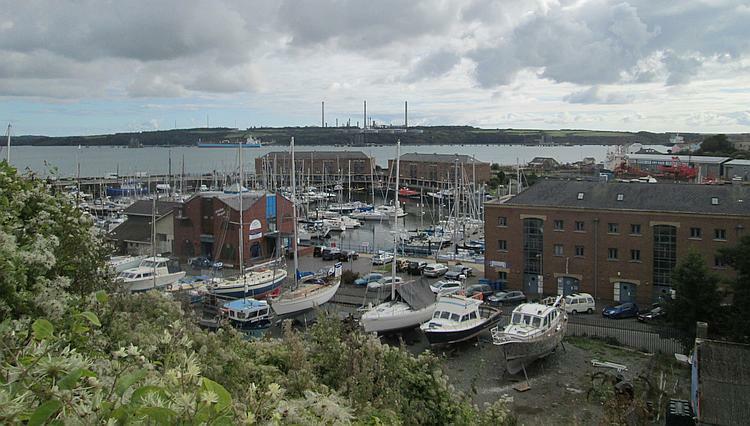 While not exactly picturesque Milford Haven Marina seems just fine. Note the background though. Back at the campsite the clouds have already gathered and just as predicted the rain arrives. We are however fortunate. We have the camper's kitchen complete with table and a few chairs. We have two microwave meals from Nisa. As the rain grows ever more intense and darkness falls we are joined by our Germanic friend. Heidi, Apparently. She has taught German in England and Scotland then English is Germany. Her English is excellent, she occasionally struggles when Sharon and I use colloquialisms but that's to be expected. She's 67, touring alone, has been here for 4 or 5 weeks and has another few weeks to go and she is fascinating. She's bright smart and full of life. We talk as the rain turns into squalls. She wishes to visit Sharon's home city of Liverpool. We do the best we can to help her find a suitable campsite but we've never been camping anywhere near Liverpool. We settle on a place near Frodsham as she can catch the train nearby, there's certainly no campsites in Liverpool. Returning to the tent feels ominous as the wind whips our hair and the rain soaks our clothes. Thankfully within the tent it is dry and once we're snuggled into the sleeping bags it's quite comfortable. If I can ignore the rain and the wind rattling the tent that is. Morning has broken and so have the clouds to reveal the amazing blue skies they have been successfully hiding. Wahoo I love the sun I do. Not being too sure of the state of Envy's screeching fan and maybe to be honest not to sure of my own confidence I opt once more to go pillion today. We will be able to go down more gravely tracks and sloping car parks without me taking forever to park. I also have rediscovered how much fun being a pillion again can be. I know I am simply enjoying the best of both worlds but I still find it hard to ignore the nagging doubt in my mind that maybe I am just a chicken after all. Sod it am I here to have fun or constantly try to prove myself? If I enjoy being a pillion on occasion then bloody well get on Ren's bike Sharon. Sometimes we have to give ourselves a little stern talking to. It is fine, honest, nothing insane about talking to oneself. It is when we begin to answers ourselves in a strange demon like voice we have to worry. Our first destination is to be Blue Lagoon, recommended by the friendly cafe owner in Fishguard. Pretty beaches beckon us for a closer look on route but car parking fees deter us from stopping at some. There is far to much to see for free so no need to pay for views around here. 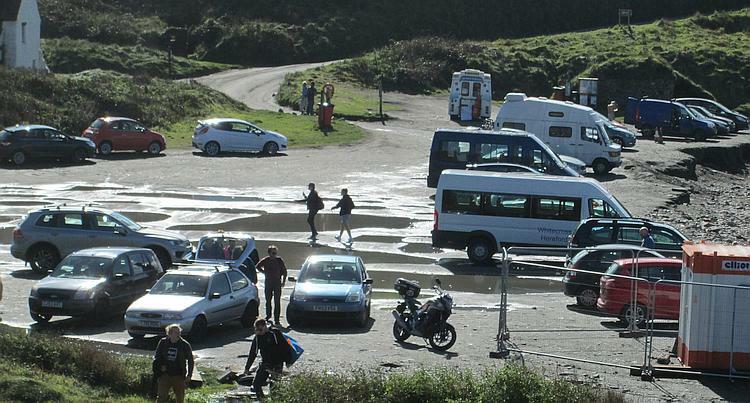 The Blue Lagoon car park is full of pot holes filled with water. They're rather deeper than Ren expected, haa haa things like this are so funny when I am not doing the riding. We bounce unharmed if somewhat surprised from the holes and park up. We see a path leading up the cliffs where the lagoon is located. A river running to the sea is however in our way. We carefully negotiate a crossing without resorting to wading and then begin the step climb up towards the path. I love the sun I do but with full bike gear on combined with a steep climb one gets a little warm. We finally get to the path puffing and blowing only to be overtaken by an elderly couple as we stand to catch our breath. What, where did they come from? It transpires there is a much easier route to the path at the other end of the car park. This negates any need to jump rivers and climb up a steep hill. Haa isn't local knowledge a wonderful thing. A group of young, fit and healthy looking college students have all congregated at the lagoon. It appears a popular place for the young to gather together. Some young men are coaststeering. The sound as they hit the water is quite loud but they all survive unharmed and go back for more, cheered on my their lady friends in a canoe. All this youth and exuberance surrounding me makes me feel suddenly aware of being quite old really. I wistfully think back to my own self at 17. So fit, so wrinkle free, not a grey hair in sight...so shy, so uncertain, so unable to swim. Haa yes I want the body of my youth but not the mind. Mentally I prefer the place I am now. Like so many of us we want the minds we have today in the bodies of our younger selves. But we cannot turn back time. Ren reminds me as I bemoan my lost youth we only have the now so lets enjoy it. I turn my gaze away from the youths and my long lost 17 year old self and glory at the beauty of nature instead. 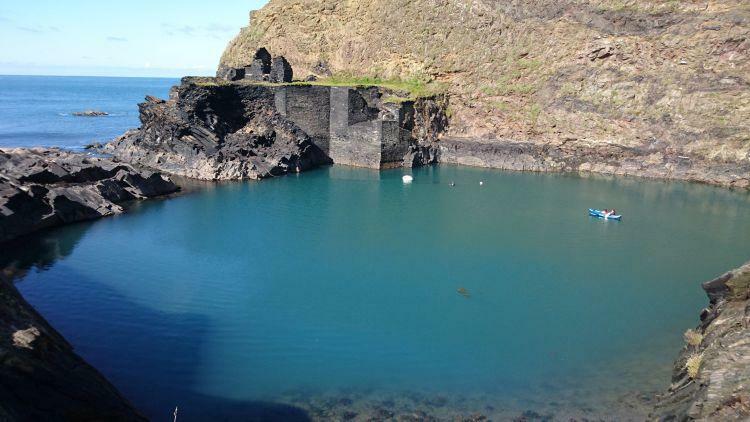 The deep black of the the rocks on one side of the old quarry contrasts sharply with the deep turquoise of the lagoon that now fills what once was the quarry itself. The sky is blue the day is young even if I am not but that is OK. It a good day to be alive and we have more riding to do. With our new found local knowledge we take the easy route down to the bike off we ride and once more I am treated to pretty villages, shimmering seas and sandy beaches to smile at. We negotiate a steep downhill switchback at Newgale and I find myself being grateful for being a pillion. I would have not been able to do that on my own bike. We eventually come to a dead end as the coastal road as it is closed for maintenance. As we turn around I spy a curious house buried in the hillside. We stop for a closer look. The house is built within the hillside and is covered with a grass roof. The large full length windows allow us a peak inside to see a large fireplace with seating around. Who I wonder lives in a house like this? It is very cute but I am sure nosey Parker's like myself stopping to snoop would get on my nerves if I lived there despite its stunning location overlooking Druidston Haven. I later learn that this earth house is called Malator and was built in 1994 by Future Systems. They say of the building "Our objective has been to minimise the visual impact of the building and to site it in a way that makes the house appear a natural part of the landscape . The soft, organic form of the building is designed to melt into the rugged grass and gorse landscape, the roof and sides of the house being turfed with local vegetation. 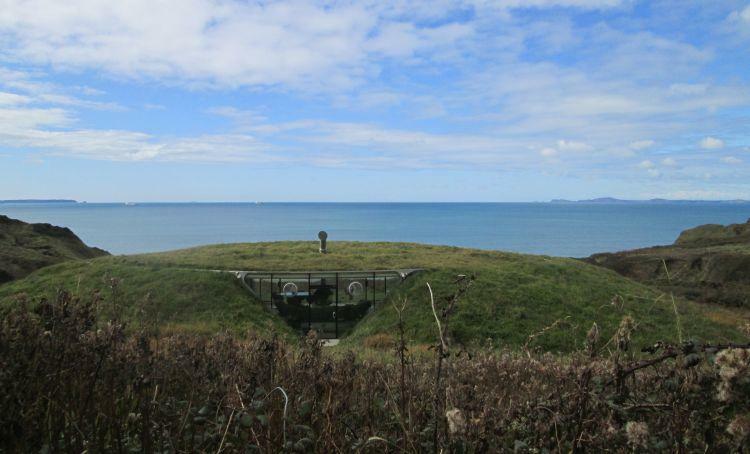 Views of the house are therefore only of grasses and the transparent glass walls outlined only by a slim stainless steel trim - an eye overlooking the sea. The surrounding landscape remains untouched with no visible boundary lines or designated garden area, ensuring the building is perceived as a natural part of the landscape." Well I almost missed it being there so I guess there aim of blending in was quite successful if not completely so. The earth house, perfect for a Hobbit. At Broad Haven we are greeted with yet another long sandy beach and a shop for lunch. I really am amazed how many beaches they are along the coast here. Just one after another, you really are spoiled for choice. Our next stop at St Brides reveals a small little cove. As much as the broad sandy beaches are lovely I prefer the little coves best. I am beginning to realise I like small things a lot. Small motorbikes, small houses, small coves...seems there is a theme here. I like to pretend with coves that they are my own secret place that no one else has yet discovered. Of course I just passed two canoeists coming up from the cove as I went down but I have a fertile imagination. The waves lap gently at the shore as a small boat gently rises and falls anchored in the shelter of the cove. The rocky cove still has a wild feel about it and with that wildness comes a sense of freedom. I stay longer than Ren just to stand and stare. To breathe in the ocean air and feel at one with the earth, the sky and the sea. Just me and the wide open ocean, well for 5 minutes anyway. In reality St Brides is far from remote. 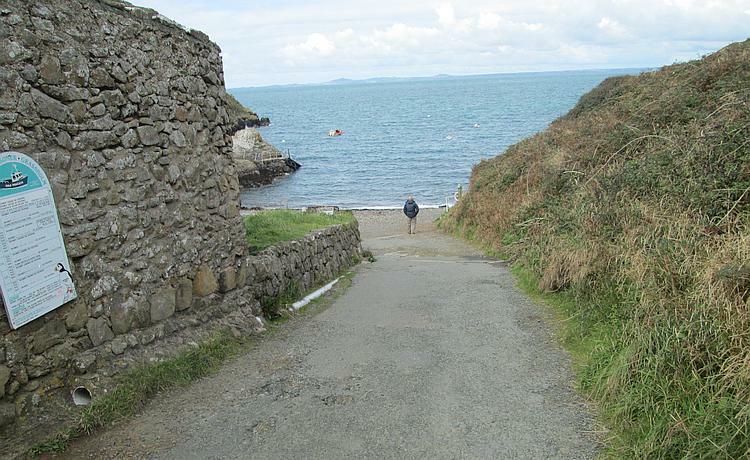 The track from the cove leads to a car park a church and toilets. There are canoeists and dog walkers aplenty. But for 5 minutes I was all alone in the cove and those 5 minutes were all it took to let me be a wild, free woman, surveying her kingdom. It was enough to put a big smile on my face and peace in my heart. Back on the bikes we find more narrow lanes to explore. Now Ren has an adventurous spirit. He will happily wander wherever with no worries it seems of dead ends or awkward slopes, unlike over cautious me. Therefore I am use to often thinking "Yikes!" as we ride. However as we ride down a rather steep slope towards a rugged looking shingle beach I for once suggest it may be prudent to stop and turn around. Ren wants to carry on to the beach. I get off. He can do this on his own thank you. The crazy fool carries on. Getting onto the beach poses him no problems. Turning around on the loose, rutted, rocky surface and getting the bike back up proves somewhat more difficult. There is a winch on the beach and I begin to wonder if it may be called into service. Fortunately Ren's skills help him out of his tricky situation. I climb back on the bike trying to look nonchalant. I am not telling him he had my heart all a flutter as I worried about his safety. Phew he made it. Well done Ren. The pic does not do justice to how steep and uneven this cove was. A lady walking her dog slipped and fell on her bum attempting to walk down on to it. Safely back at the campsite we once again spend a pleasant evening chatting to Heidi. She wishes to visit Liverpool so I suggest places to go to in the City. It has been a fun day and as I settle down to sleep I relish in the fact that I can actually now lie on my left hand side. Something I have not been able to do for years when the pain of the tumour was there. Yes happy, content me. Another well written piece, both informative and humerous. Full respect to Sharon, not only for putting up with you Ren but for putting in the miles in all kinds of weather. Cheers Shirley, you say the nicest things.